[[File:Elena_Paniva_Heel_Catch_(1994).jpg|right|400px]]Elena Panova is credited with having originated a new swinging trapeze style and technique, which she developed quite by accident at the State College for Circus and Variety Arts in Moscow, along with her teachers, Tereza Durova and Victor Fomine. When it was presented for the first time in the West in 1987 (it was at a time when communist Eastern Europe was still secluded from Western Europe), her act triggered the creation of a string of new swinging trapeze acts in a similar style, notably in Canada. When Friedrich Knie (1784-1850), the son of an Austrian doctor, fell in love with Wilma, a beautiful equestrienne, in 1803 at Innsbruck, little did he know that this adventure would be at the origin of one of the world's most prestigious and long-lasting circus dynasties. Born in Erfurt and nineteen years old, the young Friedrich left his studies without a second thought and went on to roam the country with a small company of traveling performers. Murom is one of Russia's oldest cities, dating back to the 9th century, and "home" to the Kievan Rus folk hero of yore, Ilya Muromets. It is also a Holy City that managed to keep some of its monasteries and convents open during the communist era. Yet, it is a small town, and although the Soviet government gave it a theater building, it didn't have a circus, neither was it important enough to receive the summer visit of a ''shapito'' (or ''chapiteau'' in French&mdash;a circus tent). In fact, Elena never saw a live circus performance while growing up. The Napoleonic Wars (1803-1815) had rendered the political and social environment in Austria quite unstable, and the economic situation was uneasy. Yet, the family’s determination helped them overcome the many problems that a traveling company of performers had to face, especially in such difficult times. 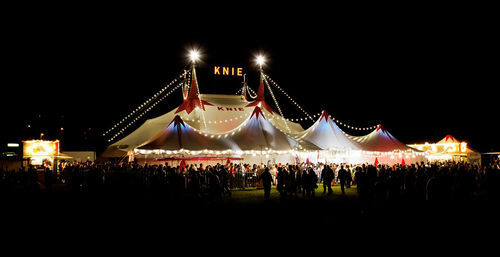 The Arena Knie was still a small affair that performed outdoors; the high rope was rigged above a stage, on which were presented tight and bouncing rope acts, along with an assortment of floor acrobatics and comedy turns. The addition of a few benches around the stage made up the arena.